Nick Wroblewski is a Midwest based printmaker of hand cut woodblocks. Focusing on large multicolor woodcuts, Nick has developed a distinct aesthetic reminiscent of the stylized Japanese masters, yet uniquely his own. His work depicts a reverence for the conversations of the wild and a loyalty to the honesty of handcrafted arts. Nick's prints can be seen in private collections, galleries, commercial designs and publications. Limited edition prints are available for purchase online. "Wake Up, Island," and “Hush Hush, Forest,” picture books featuring Nick's woodcuts, can be purchased here. Greeting cards can be purchased online at Artists to Watch. Visit an exhibition or gallery to view and purchase prints. Contact us for questions and payment options. A woodcut is an image printed from the carved and inked surface of a block of wood. There are a number of different types of woodcuts. A one-color or black and white print can be made from a single block of wood. The simplest colored prints are made by adding color after the image outline has been printed. 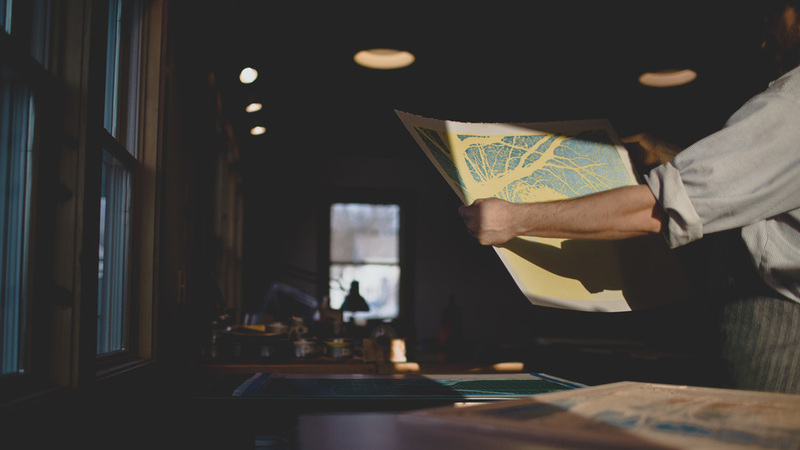 Prints can also be made in a traditional way through either a reduction process or a multiple-block printing process.